After another gloss coat over the decals, it was time for weathering. I went with Raw Umber oil paint this time and I like how it turned out. It’s subtle on the dark gray sections so I did the wash twice. The weathering looks more obvious on the bottom. 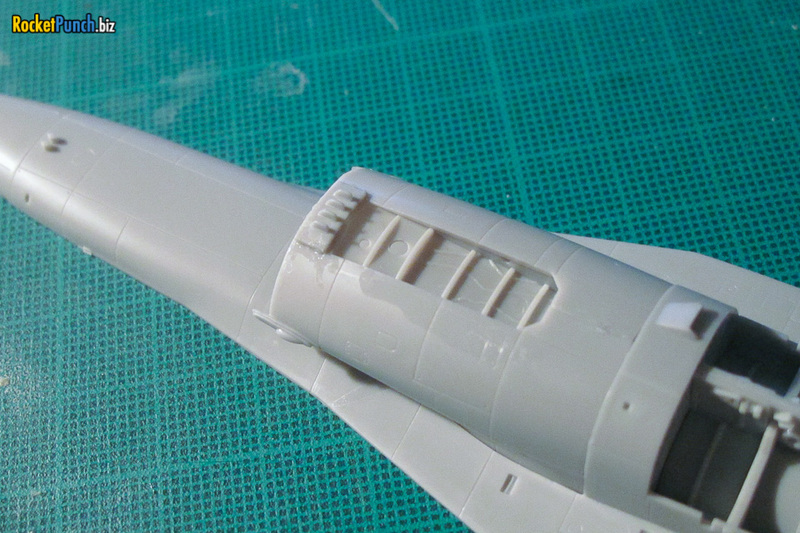 Then the pylons, stores, landing gear and the small details are added with Gator Glue and superglue. 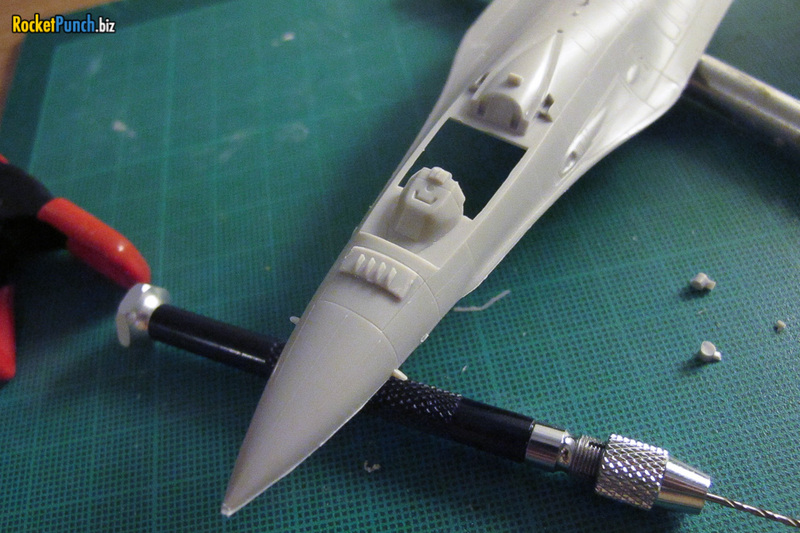 I also added the port side nose light with a circle mask and silver paint. All that’s left is a final satin coat, painting up the wing lights and removing the canopy and exhaust masking tape and I’m all set for build 11 of 2016! It took a few rounds but the salt weathering is done. It’s still a bit subtle but I think it should look better after some weathering with oil paints. 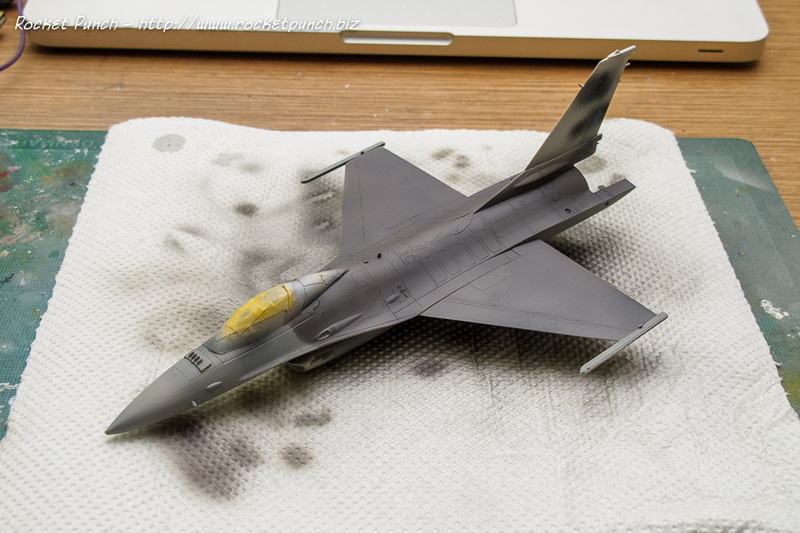 The F-16 I’m modeling requires a black tail and pattern on the nose so I masked and sprayed Black Grey for this. After a day of curing, it was time for a gloss coat. I managed to get my hands on AK Interactive’s new Intermediate Gauzy Agent Shine Enhancer. This went on really easily straight out of the bottle and doesn’t affect the hue of the color underneath. Plus it works for both metal and normal colors. Nice. 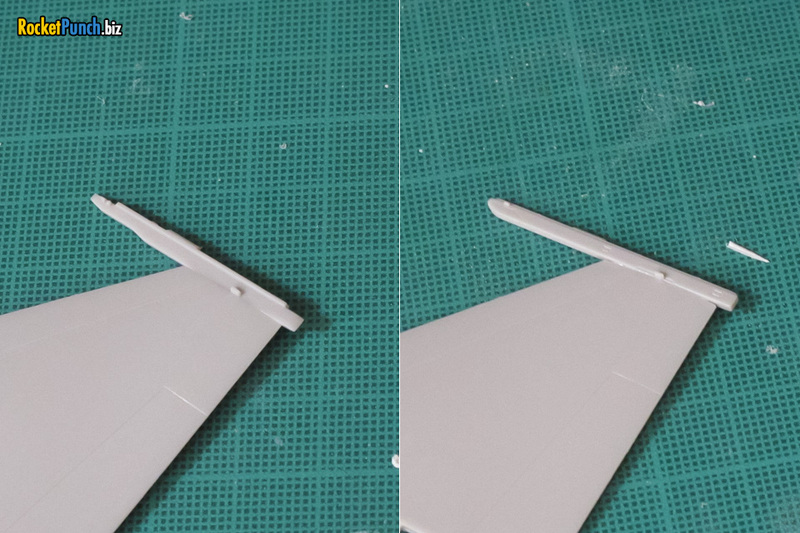 I managed to lose one of the drop tanks and its pylon so I ended up grabbing a new pair from an Academy F-16 kit. 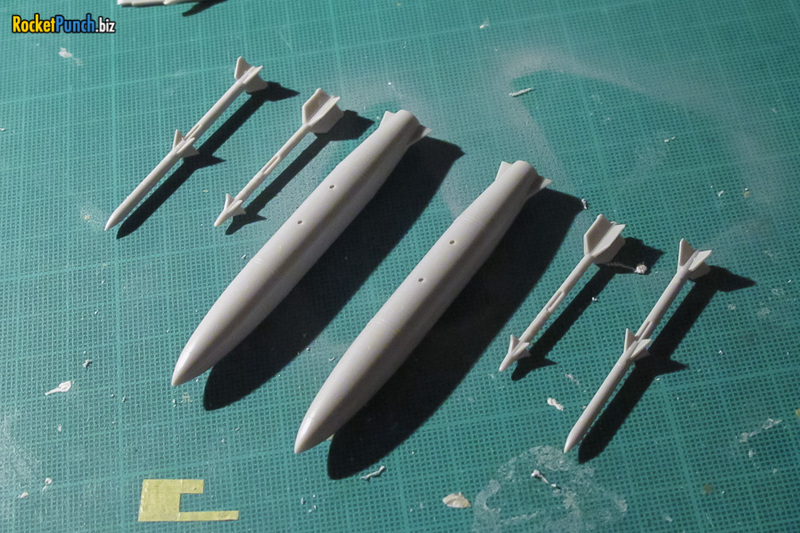 These have much better details than the originals but to be fair to the Hasegawa kit, it’s at least 25 years old. I decided to arm my F-16 with only 1 AIM-120 and 1 AIM-9 as per configured for QRA (Quick Reaction Alert). 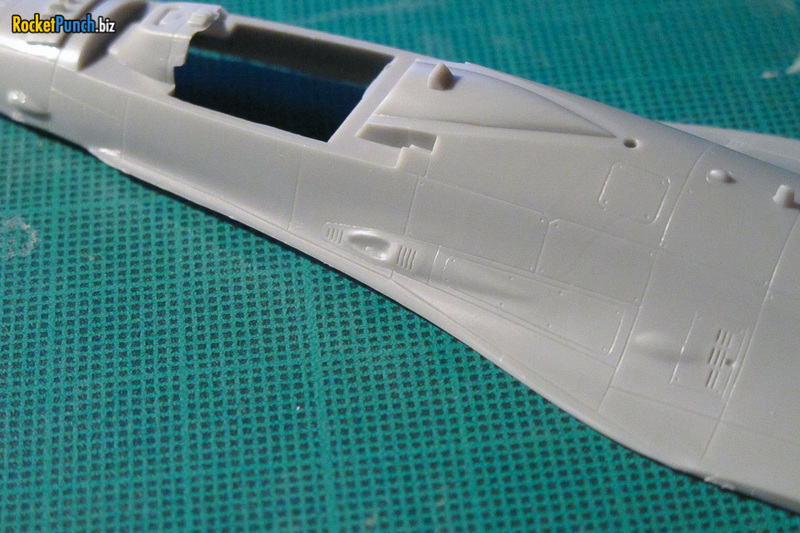 The gloss coat dried to the touch within 10 minutes but I let it cure for 24 hours before starting on the decals. For this F-16, it will wear the special Diana markings from 5 Stormo from April to June 2010. Decals are from TwoBobs. As usual, these went on very easily. The roundels are typical of TwoBobs: 2 layers stacked on top of each other but the Diana markings themselves are single layers. 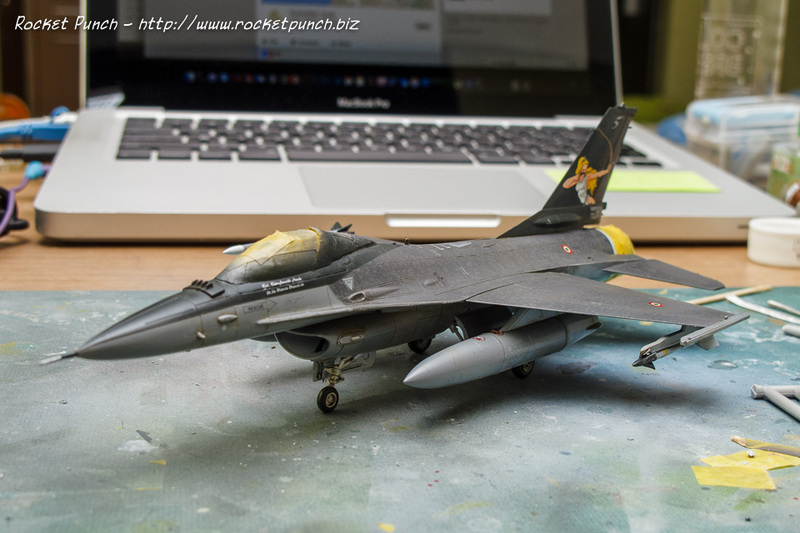 This particular F-16 had a very clean tail but the fuselage was quite weathered. Hopefully I can pull it off. OK… another Queen off the shelf. Painting begins with trying something new. 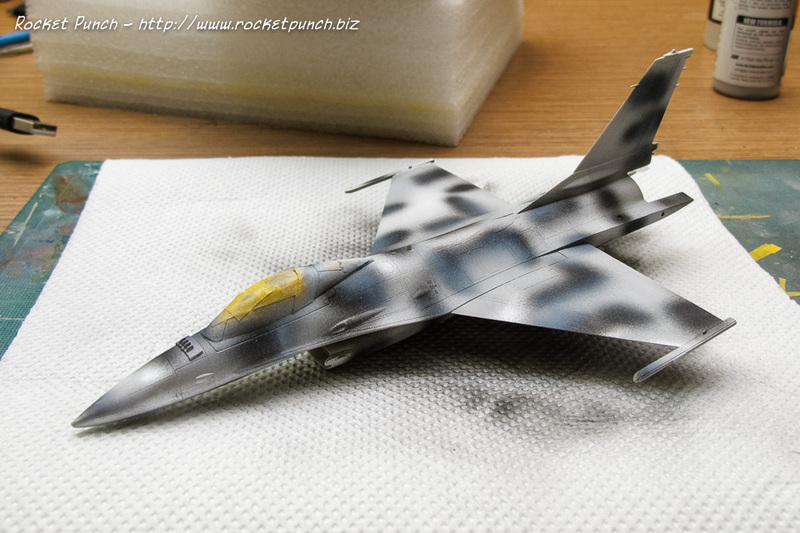 While painting the P-51, I sprayed the leftover paint in the cup on the F-16 in a random pattern. The intention is to have a randomly colored base to cause some variation in the main colors. I then smoothen the base coat with a 3M sponge. 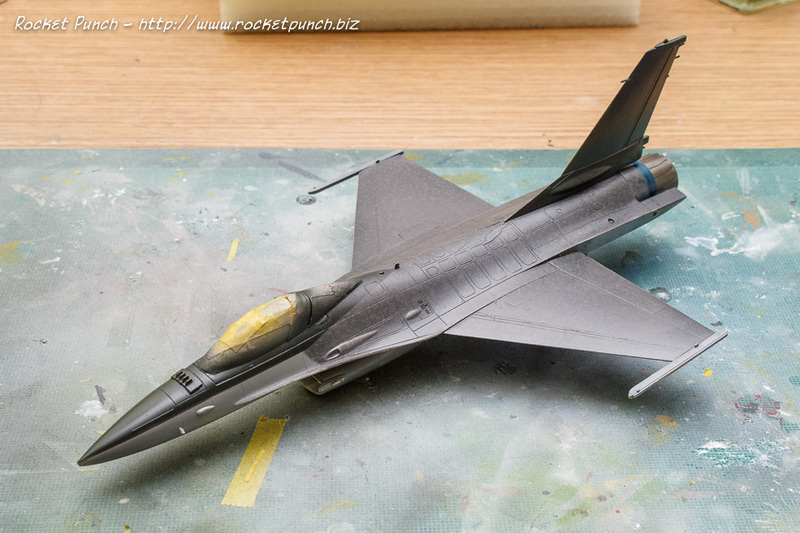 The AMI F-16 colors are the newer 2 tone grays: FS36270 and FS36118. I went with Vallejo Model Color Medium Sea Grey for the lighter gray and Mig AMMO Medium Gunship Grey for the darker tone. 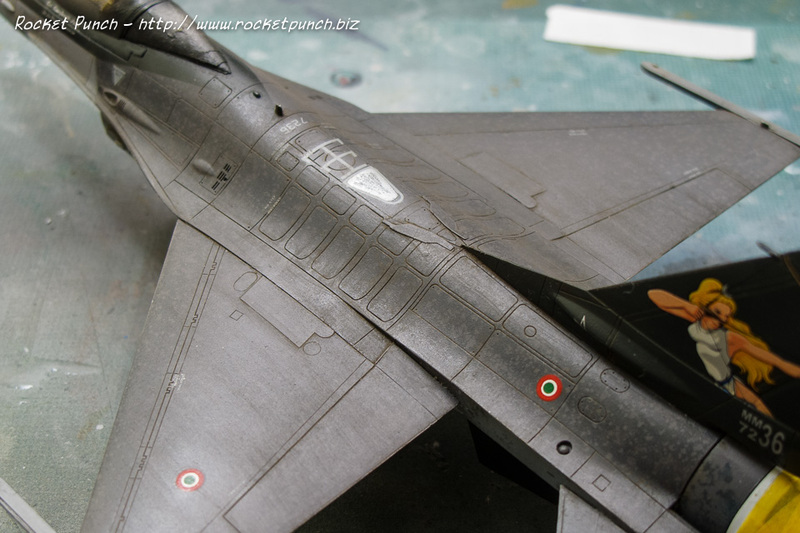 The Mig AMMO paint comes thinner than the Vallejo but coverage was still quite good. The randomly colored base coat shows through on the light gray but it’s subtler on the dark gray. 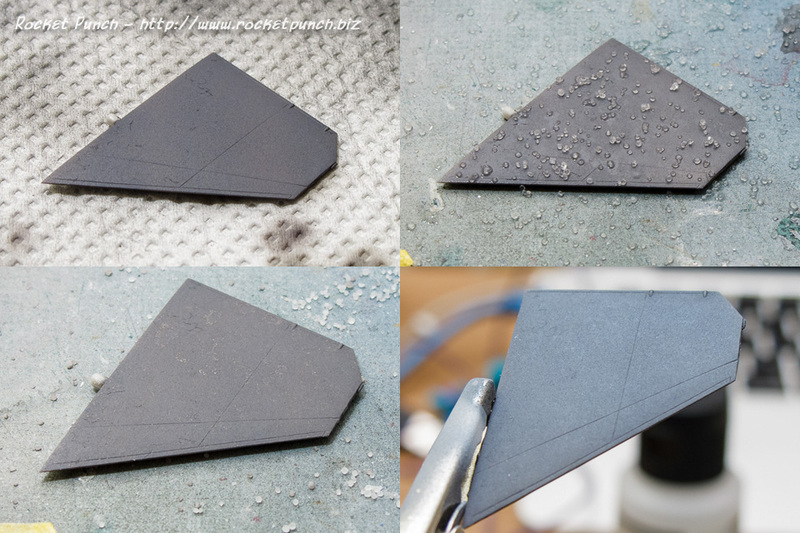 I decided to try to make the camouflage more patchy with salt weathering. First an experiment with a tail stab. I sprayed water all over the part and then sprinkled table salt on it. Once the water has evaporated, I sprayed a slightly thinned mix of Medium Gunship Grey. I only did a light misting coat. Then I rubbed off the salt and wiped clean with water. The effect works but I think an even lighter toned mist coat would work better. It’s a bit too subtle as is. Anyway, more work needs to be done. 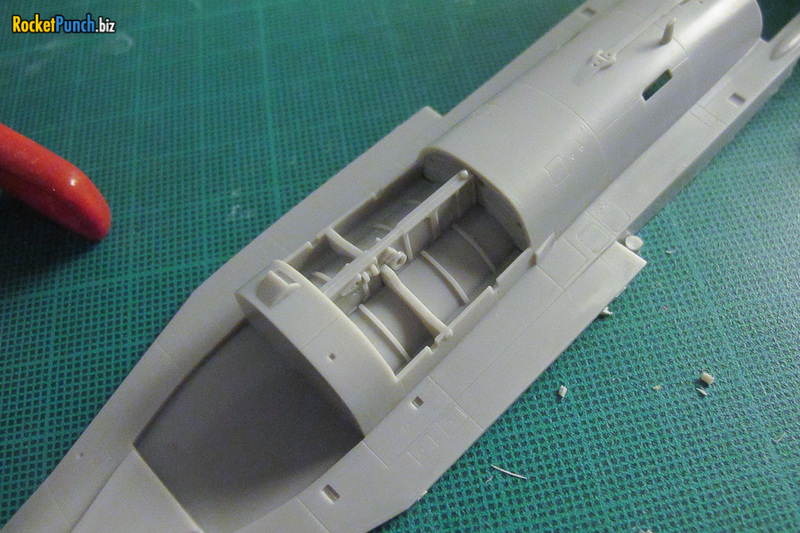 Work on the cockpit begins. The consoles are all decals. Looks decent enough especially since I’m keeping the canopy closed. Ejection seat next. There’s quite a few details missing like the prominent canopy breakers and the green oxygen bottle on the left side of the seat. I added seatbelts using strips of masking tape. They are held in place with white glue. 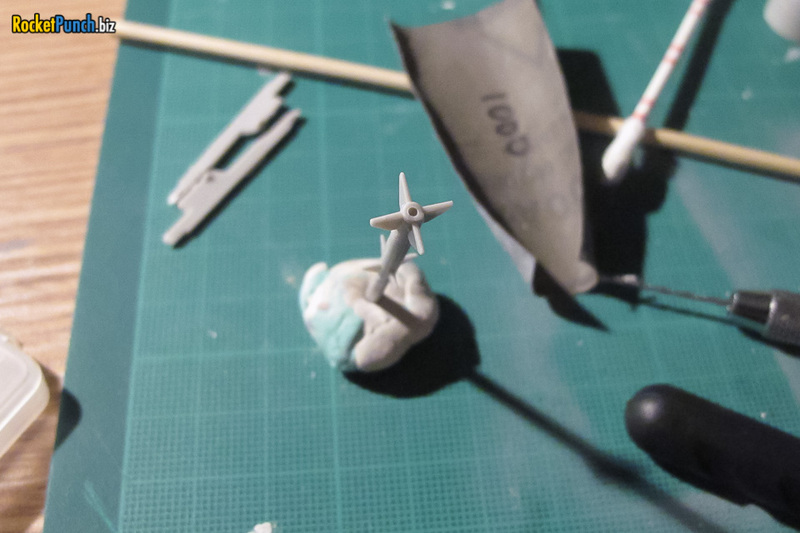 Then it’s a simple of handpainting, giving a dark wash and then lightly drybrushing the details. 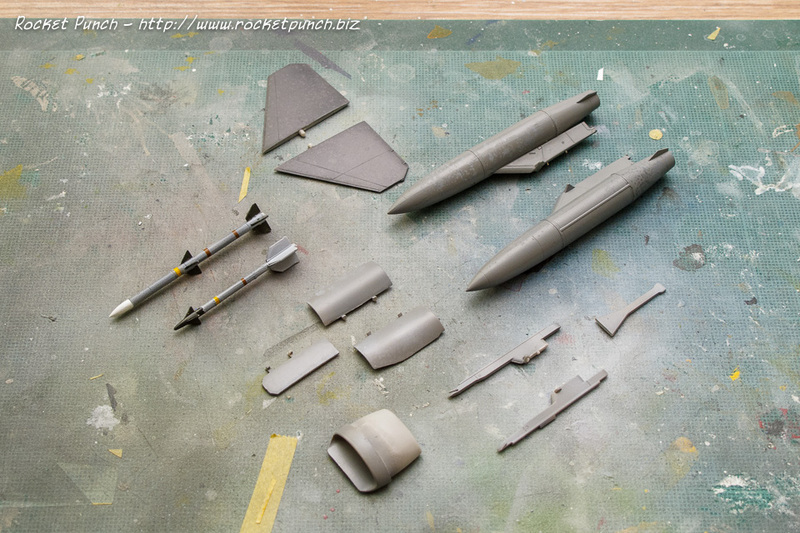 The kit comes pre-molded with the older AIM-9 missile rails. 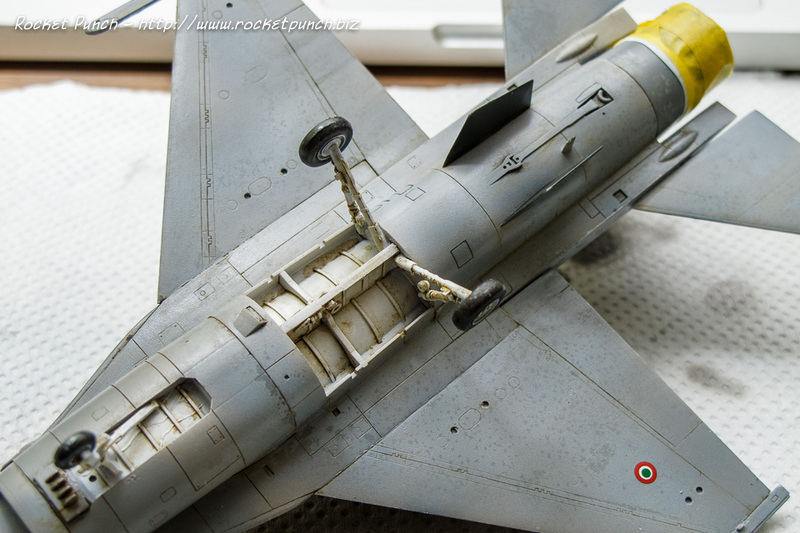 The Italian ADFs replace these with the LAU-127 rail which allows for the mounting of the AIM-120 AMRAAM missile. 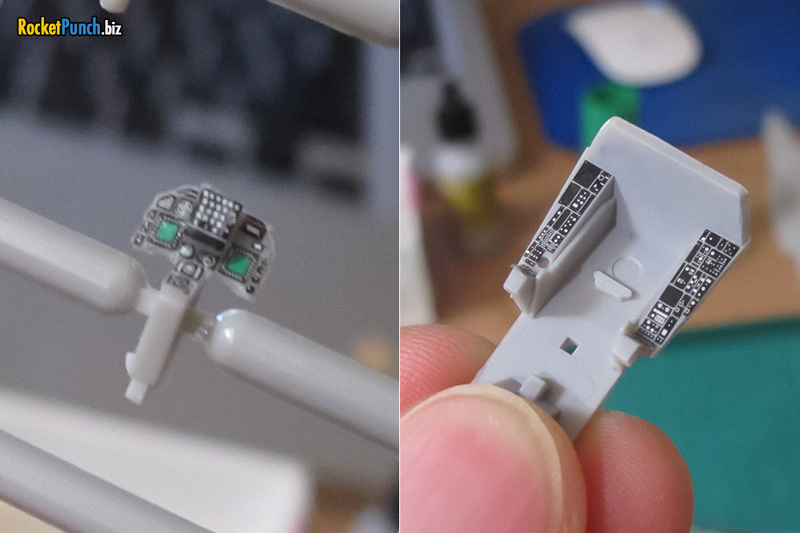 Hasegawa instructions say to cut off the existing rail and mount this new rail that comes in a separate sprue. So I chopped off the old rail and cemented the new one on. The Italians use the ADF for the air defence mission and they usually carry a maximum of 4 missiles (2 AIM-120s and 2 AIM-9s) for this purpose. The number 3 and 7 hardpoints are therefore usually left empty without even the pylons. The kit comes with the holes for the pylon pre-drilled. These need to filled up. I used liquid putty for these. 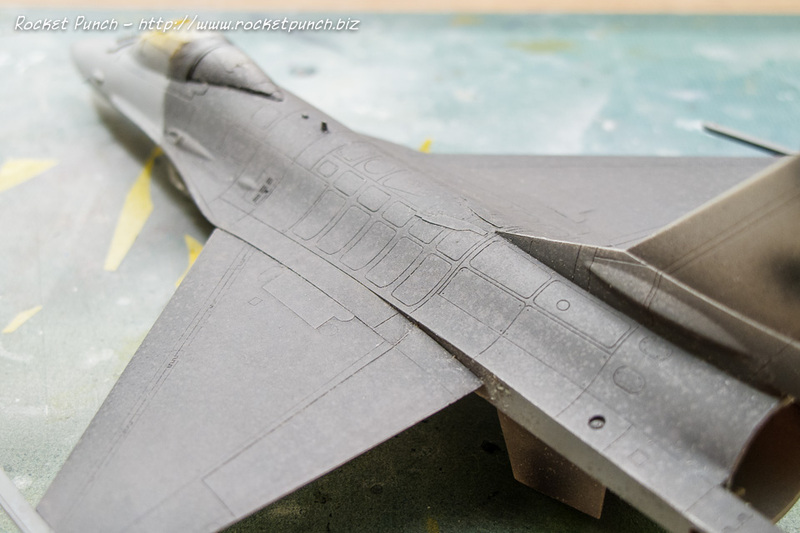 With most of the construction done, I can close the top and bottom halves of the fuselage then cement the wings and tailfin. I then sprayed black gray onto the cockpit consoles and frame. Then the seat goes in. Stores next. 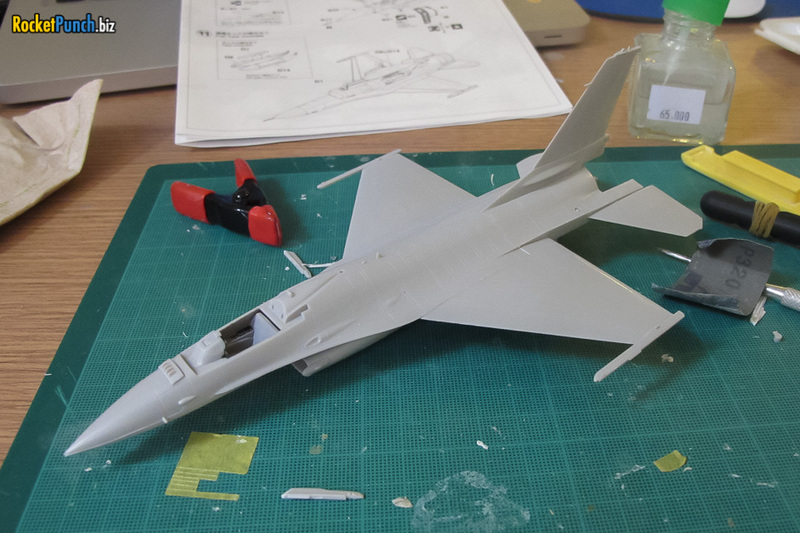 A pleasant surprise is that Hasegawa provides 4x AIM-9 Sidewinders (2 old, 2 new versions) and 2x AIM-120 AMRAAMs. 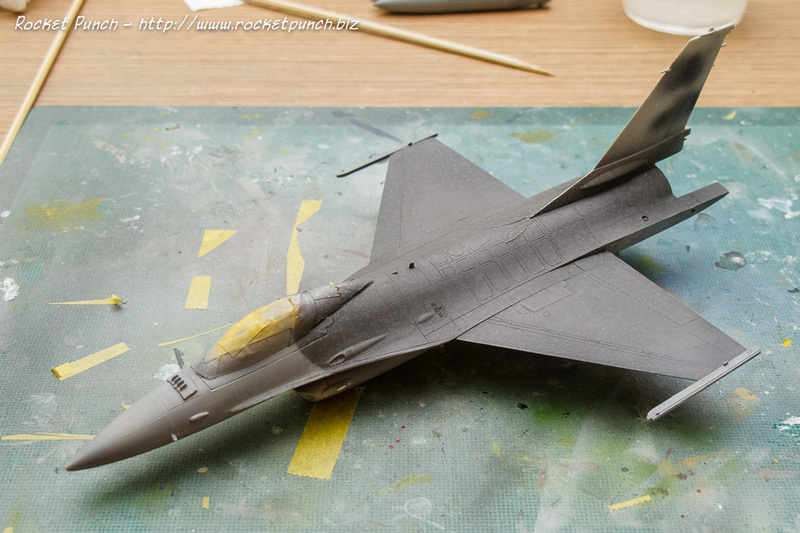 I’m giving the F-16 a standard air-to-air load of 2x AIM-120, 2x AIM-9 and 2x 370 gallon external fuel tanks. From what I gather, their F-16s don’t normally carry ECM pods. 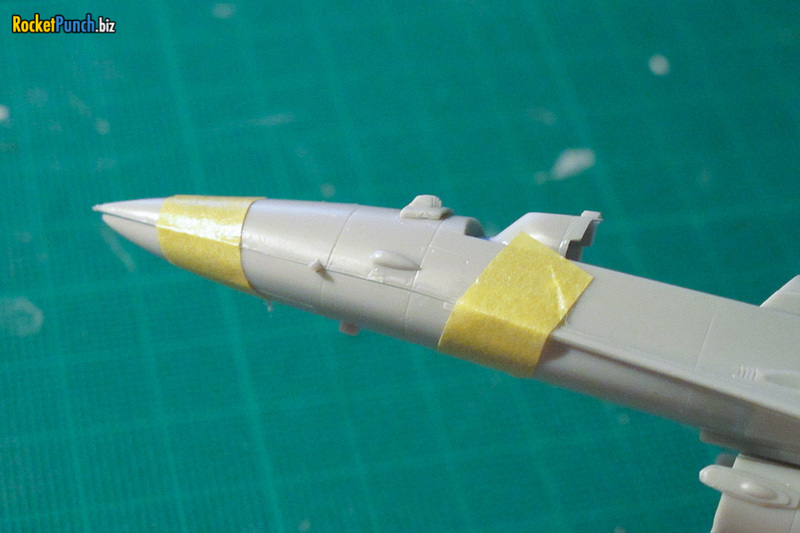 I also drilled out the back of the missiles to simulate their exhausts. I previously previewed this, decided to just try to quickly build one (yeah right). 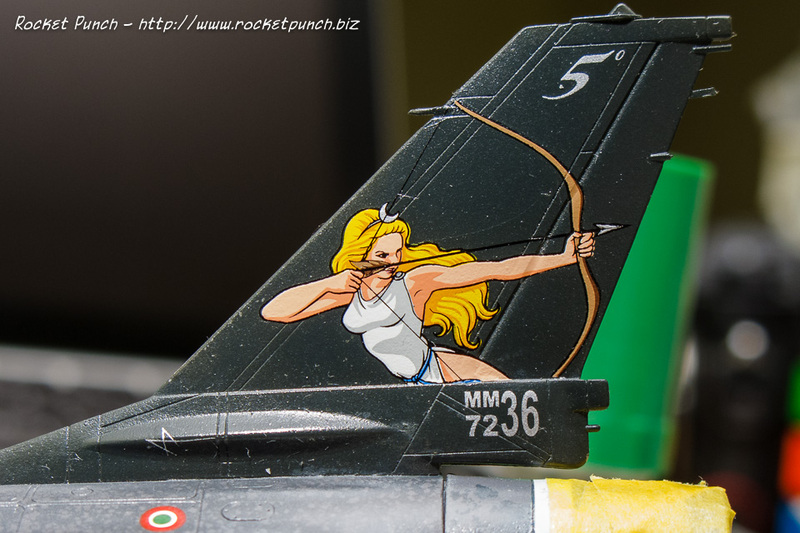 This will be the F-16A ADF (Air Defense Fighter) from the Italian Air Force (AMI – Aeronautica Militare Italiana). As of 2011, the AMI operates 27 ADFs in an air defence mission. 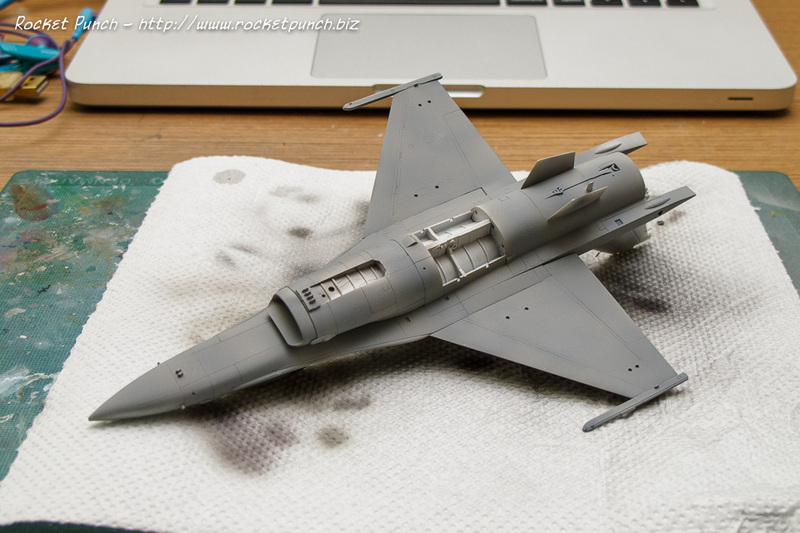 The Hasegawa kit is from the 1980s and it’s clear the mold has gone through many runs as almost every part has some sort of flash that needs to be cleaned up. So what makes an ADF an ADF? Externally there are some obvious differences. 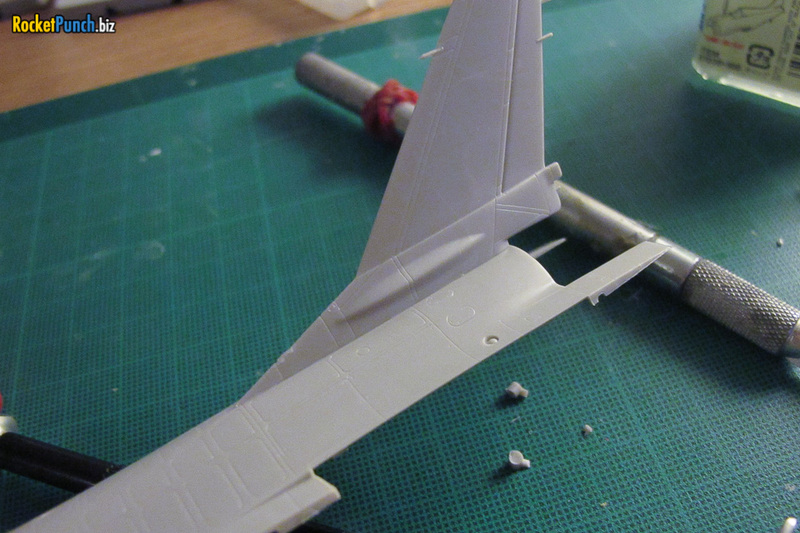 First up, there are new antennas (‘bird slicers’) in front of the front landing gear. There are also bird slicers in front of the canopy. 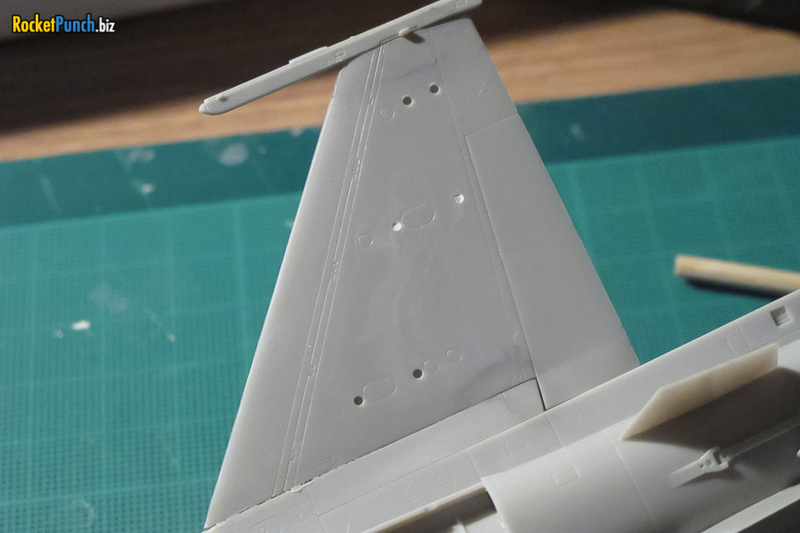 There is a huge bulge at the base of the vertical tailfin. 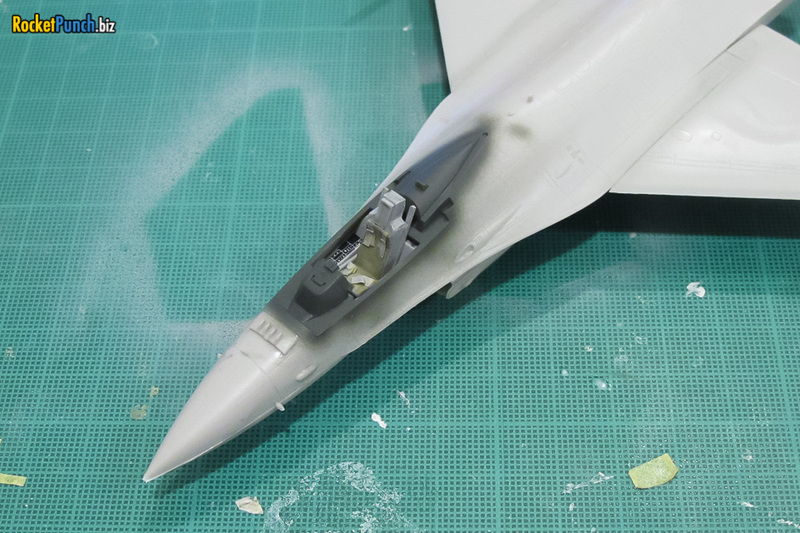 Hasegawa did miss out some ADF-specific details. There is supposed to be a searchlight on the left side of the nose for night interceptions. The ADF is basically an F-16A but it does sport the 2 vented F-16C-style gun vent port. I might not do anything about this one because I’m not too confident about my scribing skills.